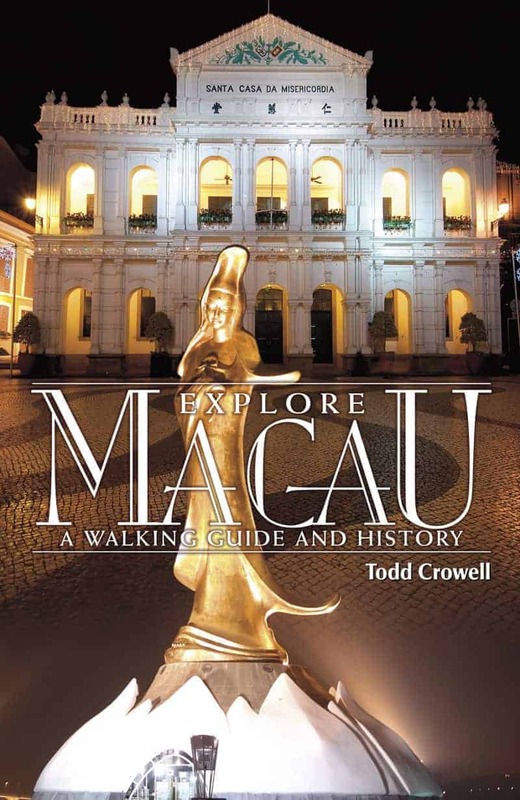 Todd Crowell’s guidebook Explore Macau describes eight routes around the urban peninsula and its outlying islands, sufficient to explore and understand this fascinating old city and its unique blend of European and Asian architecture, cuisine and cultures. Here we excerpt one of Todd’s guided walks. Click the map to see at larger size. Route: Down Rua George Chinnery to Lilau Square, continuing on down Calçada da Barra to the A-Ma Temple, then around Barra Point to Avenida da Praia Grande. Chief Points of Interest: Lilau Square, Mandarin House, Moorish Barracks, A-Ma Temple, Macau Maritime Museum, Penha Hill, Santa Sancha Palace and the former Bela Vista Hotel. The name Rua George Chinnery (1) just behind St. Lawrence’s Church enshrines the memory of the 19th-century British artist who lived near here and whose ink drawings and paintings form the main impressions of Macau as it must have looked more than 100 years ago. The artist actually rented rooms (now gone) on the neighboring Rua Ignacio Baptista, which was close to some of his favorite subjects: St. Lawrence’s Church and the Chapel of St. Joseph Seminary. Of course to see Chinnery’s most famous scenery one needs to go down to the Praia Grande although you will have to use your imagination to screen out the reclamation. To plunge into this neighborhood is a little like stepping back into old Macau, a town of narrow streets, hidden nooks and patios and the sounds of hawkers. Just behind the square, down Travessa Antonio Silva, is a building which once represented the height of Chinese residential architecture in Macau. It is based on the design of the home of a senior official of Imperial China, hence the name Mandarin House (3). The sprawling complex with nine apartments was built in 1881 by Zheng Guan Ying (1842-1922), a notable official and writer (Sun Yat-sen is said to have admired his critique of bureaucratic decay, The Jeopardy of Civilization, written in the Mandarin House). It has been all but abandoned since a fire in 1994, leaving only a few stray cats as permanent residents. Every time I have visited the house in the past, it has been derelict, technically private property, although there was never anybody to stop me from walking in and wandering around. Evidently the details of ownership have been resolved in order to allow the Macau government to take over the property and begin an extensive renovation program aimed at restoring the house to its original condition. This should make it one of the most splendid cultural artifacts in the enclave. Continue along Calçada da Barra and you will soon come to the Moorish Barracks (4), a beautiful public building which, with its Arabian arches, shows the influences of the Indian subcontinent. The ‘Moors’ were actually Indians from Goa who were brought to Macau to augment the local police and defense forces. It was for these soldiers that the Moorish Barracks were built in 1874. It is now the headquarters for the marine police and is not open to the public; but stroll along the beautiful veranda and imagine what it must have been like to look out over the Inner Harbour before the view was obscured by buildings. A few more meters’ walk brings you to the waterfront. On the left, along Avenida Almirante Sergio, are a row of popular Portuguese restaurants. The first one, A Lorcha (5), is one of Macau’s better “new wave” Portuguese restaurants with both excellent food and an impressive wine list. A block or so north one finds O Litoral and Porto Interior Restaurants, both hidden behind fake Macanese façades and both enjoying their own clientele. Retrace your steps to the Largo do Pagode da Barra, a pleasant plaza fronted by an attractive green Macanese mansion that used to house the Maritime Museum now located across the street, and the A-Ma Temple (6), easily the most famous and picturesque Chinese temple in Macau. The temple was built in 1605, several decades after the Portuguese settled on the peninsula. There must have been some sort of shrine to A-Ma here before then, since it is well established that the temple existed before the Portuguese arrived and that it gave its name to Macau. The name, or a version of it, seems to have been current when the temple was built. It was extensively renovated in 1828, giving it the general appearance that it has today, indeed as it was depicted by all of the famous 19th-century artists of Macau, such as Chinnery and Auguste Bourget. The temple complex consists of four pavilions. The first three are dedicated to Tin Hau, another name for A-Ma, who is the patroness of seafarers and popular with fishermen all along the South China coast. (Approximately 20 other temples to A-Ma exist in Macau, not the least being the imposing statue recently erected on Coloane Island). The fourth and highest pavilion is dedicated to Kun Iam, the goddess of mercy. Numerous smaller side altars are for lesser Buddhist and Taoist deities. The site is built on the side of a hill, and you ascend by winding paths and steps, relieved at intervals by small temples, shrines and inscriptions and shaded by bamboo groves and banyan trees. Enter by way of a short flight of concrete steps and through a ceremonial gate. In the courtyard is a large rock on which a Chinese junk has been carved in bas-relief. This is meant to represent the ship which, tradition holds, brought the goddess A-Ma to this place. There are various legends. The most common holds that a fleet of junks was dispatched from Fujian province with a young woman on board. A storm arose and sank all of the ships save the one with the maiden. She took the tiller and brought the ship safely to Macau. There she went ashore and disappeared. The other passengers found only a statue of the goddess. On the junk is a flag with four Chinese characters on it; they translate as “crossing the river safely.” Progressing up the hill, you pass through an oval “moon gate” painted bright red with nine dragons on the frieze. Behind is an inscription that reads, in Chinese, “the path of enlightenment.” Continue upwards past the third and perhaps shabbiest of the three temples to Tin Hau, navigating between large boulders that make the temple grounds look a little like the Camões Grotto, to the fourth and last temple dedicated to Kun Iam, the goddess of mercy. Off to the right is a curious inscription on a boulder in two red Chinese characters said to be a Taoist phrase effective against misfortune. Across from the A-Ma Temple is the Macau Maritime Museum (7) (open 10 a.m. to 5 p.m. daily except Tuesday, admission 10 patacas). The museum is attractive and informative, although it depends heavily on ship models and table displays rather than historical or genuine artifacts. Long planned, some of the original exhibits destined for a future museum were destroyed when the U.S. Navy bombed the Portuguese Navy Maritime Aviation Hangar on Taipa in 1945 by mistake. The museum proper comprises three levels. The first depicts, with various models of Chinese fishing junks and examples of fishing techniques, the life and work of fishermen along the South China coast. A model of an oyster field shows growth over five years. Level 2 focuses on the great voyages of discovery by Chinese and Portuguese explorers. A model of a Japanese warrior from Tanegashima, the island off the coast of Kyushu where, in 1543, the Portuguese set up Europe’s first trading post in Japan, underscores the importance of the Japanese connection with early Macau. Level 3 explores maritime transportation through various ages: a mock up of a ship’s bridge, more models of modern passenger ferries from steamships to the jetfoils, and replicated remains of a Song dynasty Fujian junk. A spacious café with a white tented roof occupies a tiled outdoors area between the museum and the wharf. The museum also operates two junks which make 30-minute tours of the Inner and Outer Harbours (daily except Tuesday, fare 10 patacas). From the Maritime Museum continue walking along Rua de São Tiago da Barra to the tip of Macau’s peninsula. There one comes to the Barra Fort (8), constructed in 1629 and designed to defend the entrance to the Inner Harbour. It was at one time an elaborate complex supporting a garrison of about 60 soldiers, their stores, cannon and ammunition. In 1740 a chapel was built in the fort dedicated to St. James (S. Tiago). The cannons were sold off to earn money to help care for refugees during World War II. In 1976 the remaining carcass of the old fort was converted into a charming inn, the Pousada de S. Tiago (9). Cleverly incorporating the ruins of the fortress, the chapel, the cistern (now an ornamental fountain), and ancient trees are melded into the design. The boutique hotel has only twelve guest rooms, each furnished with antique Portuguese furniture. Continue along the periphery road, which now becomes Avenida da Republica. This small stretch from the tip of the peninsula to the old Bela Vista Hotel still has something of the feel of the old Praia Grande waterfront as it existed before the enormous reclamation project created the Nam Van Lakes. There are trees, walkways and benches, although the vista across the Sai Van Lake is not very interesting these days. Close to the tip is a statue of Henri Dunant (10), the Swiss founder of the Red Cross. It was erected in 1997 to honor the 70th anniversary of the founding of the Macau Red Cross, whose headquarters is located in a fine complex across the street. A little further along brings one to a marvelous wedding cake of a building, in bright pink with white trim. This stately residence, the Santa Sancha Palace (11), was built in the mid-19th century as a private residence and served as the home of Portuguese governors from 1937 to the handover of sovereignty in 1999. 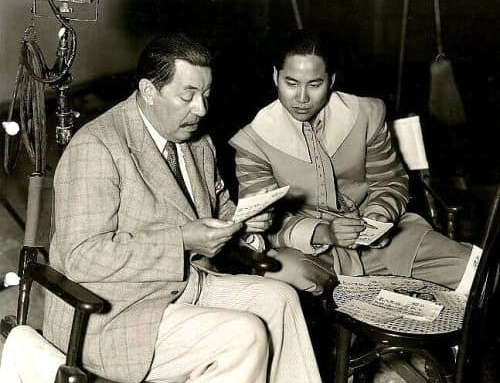 The first Chinese Chief Executive of the Macau SAR, the scion of a wealthy banking family, chose not to live in it, preferring his own mansion on Penha Hill. DETOUR: From Lilau Square walk up Rua Lilau, climb a flight of concrete stairs and follow the cobblestone streets to the peak of Penha Hill. This is one of the two main promontories of Macau, the other being Guia Hill. Here the Portuguese erected another small fortress which was once connected by a wall to the Dom Parto fortress on the waterfront near the former Bela Vista Hotel. In 1622 Our Lady of Penha Chapel (12) was also built, and throughout most of Macau’s history, it also had a small hermitage for monks. There was nothing much else, the peak being isolated and difficult to reach. The fort was demolished in the late 19th century, and in the 1930s the chapel was totally rebuilt in the form it is today and a small bishop’s residence was attached to it. 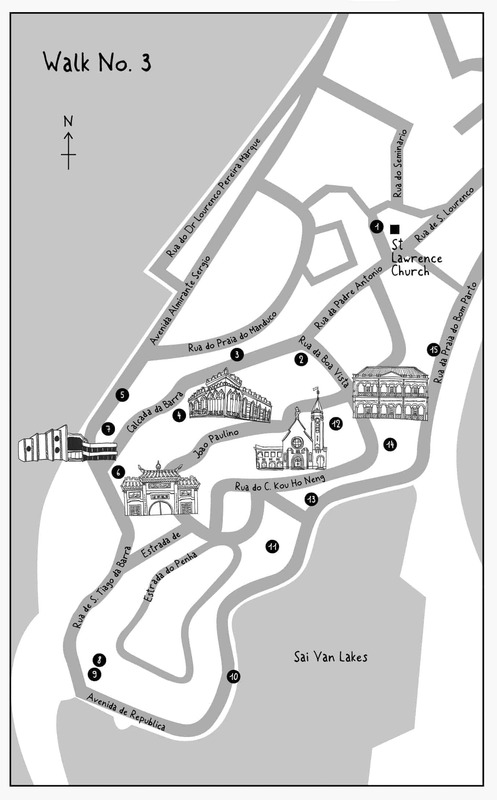 Before the 20th century Macau’s bishops had resided at St. Paul’s or with churches belonging to their orders. In the 1970s a new residence was built next to the Cathedral, so Penha was used as a bishop’s residence for only 30-odd years. It is now part of the University of Macau. Penha Hill provides excellent views looking out over the city and harbor, but it is a kind of dead place, the quiet disturbed only by the arrival of a tour bus chugging up the hill and disgorging a flock of Chinese tourists. In contrast with the city’s other showcase churches, all in neo-classical or baroque style, the chapel looks faintly Gothic. It is stone gray in color, with a tall steeple on one side and an iron compass on the top. The inside is unremarkable save for the lovely oval stained-glass window over the altar depicting the Madonna and Child. From Penha walk back down Estrada de D. Joao Paulino to the pink and white gates of the Santa Sancha Palace. The palace commands a prominent position in Macau’s best residential area. The contour of the land has been unchanged since it was built, so that the building is easily visible from various parts of the city. The two-story building is very pleasing to the eye, having a perfectly symmetrical façade crowned by a curved pediment which used to boast the Portuguese coat of arms, and now the seal of the People’s Republic of China. The building is made out of plastered brick in the Pombaline style similar to the Government Palace further down the Praia (which once belonged to the same owner.) Surrounding the whole is a granite wall with Western-style parapets decorated with Chinese ceramics. At the end of the grounds is a circular belvedere with a large shade tree, which must have been a wonderful place to sit on a cool summer’s night looking out at the Pearl River and Taipa Island. It was built in typical Mediterranean style with large flowerpots standing on the balustrades. The interior is furnished with Chinese and Portuguese furniture. Down on the Praia is an excellent restaurant, Henri’s Galley (13). This unpretentious establishment has a nautical flavor – the walls are adorned with a ship’s wheel and prints of old sailing ships, oars and signaling flags, and it has a few outdoor tables. The house specialties, African chicken and spicy prawns, are excellent. The top Portuguese in Macau moved out of Santa Sancha and into the legendary Bela Vista Hotel (14), disappointing hundreds of aficionados of what may have been Macau’s most beloved hotel. It was built in the 1870s on the ruins of the Dom Parto Fort, the oldest in Macau, whose foundations are still visible from the road. It began life as the Boa Vista Hotel in 1899, aptly named for its incomparable view over the Praia Grande Bay and Pearl River but in the succeeding 100 years underwent several permutations, becoming a secondary school (renowned Portuguese poet Camilo Pessanha once taught there) and a billet for Hong Kong civil service cadets. 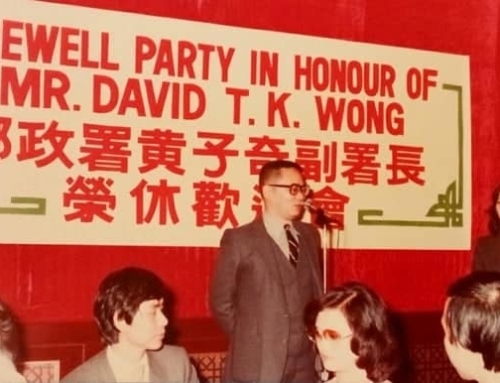 It reverted to being a hotel in 1967; not the best of times, considering the dearth of visitors because of the violence in the aftermath of the Cultural Revolution. Newly known as the Bela Vista, it began rebuilding its reputation for gracious, colonial-style hospitality, each of the 23 rooms boasting high ceilings, huge bathtubs and a veranda, although the occasional peeling paint gave it a slightly seedy look. In 1990 the Mandarin Oriental hotel group undertook an expensive restoration, reducing the two dozen rooms to only eight luxury suites, earning the hotel rave reviews as one of the world’s leading boutique hotels. The last guest moved out on March 28, 1999, after the building was sold to the Portuguese government as the official residence of the consul general. The rest of the walk provides little impression of the grandeur of the old Praia Grande. Most of this area has undergone massive reclamation in recent years. At one time a row of elegant government buildings and merchants’ mansions fronted the waterfront, but the only reminder of its glory days is the red-and-white Government Palace (15), which has served as the governor’s office since 1884. It was originally a private mansion, designed by the same architect who built the Santa Sancha. The Legislative Assembly moved to new quarters on the reclaimed island on the Nam Van Lake, and the building is now used mainly to welcome dignitaries when they arrive in Macau.